Being as enthusiastic about our industry as I am, I am an avid reader of some of the great magazines available for ATVs. 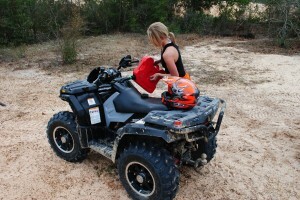 As such, I was disturbed to read a recent review where Kolpin’s Fuel Pack JR was given a 5 star rating despite leaking fuel from the seal while riding. Now I have bought plenty of $5 hardware store fuel cans that leaked around the spout, granted I also got what I paid for….a $5 fuel can. 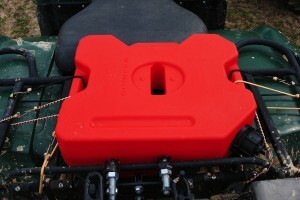 However, if I am paying $50+ for a fuel pack designed for ATV riding, then I expect it to hold all the fuel in. I was determined to find a real 5-star winner when I found RotopaX by GREAT Outdoor Products LLC. 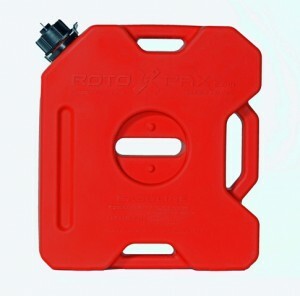 I got in touch with Jason at RotopaX and ordered the new 1.75 gallon gasoline pack to try out. Right out of the box the RotopaX fuel can feels tough. The shell is obviously thicker than fuel cans you’ll find at your hardware store. This is thanks to a rotational molding process used to manufacture them. This process is more costly that traditional blow molding, but creates a higher quality product as is evident with the RotopaX units. RotopaX also provides several secure mounting options that lock the pack down through the mounting hole found in the center of the pack. There are several variations including one that locks to prevent theft. We rode all day without the least bit of fuel loss at the spout, even with the tank laying down. During a recent day trip I had the RotopaX fuel pack straped horizontally on my rear rack. It was full of fuel and I wanted to give it every chance to leak. Through trails, mud and bouncing through sand dunes the RotopaX never lost a single drop of fuel. It held up incredibly well through some of the most aggressive terrain I could put it through. I felt this was especially important after the Kolpin review. How can a fuel pack get 5 stars when it leaks? Sounds like 2 stars to me. RotopaX is your 5 star winner. Like an extra life in a video game, playtime has been extended! RotopaX has a full range of sizes. They also make the mounts in various colors designed to specify contents like diesel, kerosene, water, etc. The packs are also EPA and CARB compliant. They also have emergency preparedness and empty storage packs.To check out their full offerings visit them at http://www.rotopax.com or call them at 801-299-1885.